(Nanowerk News) When it comes to metal catalysts, the platinum standard is, well, platinum! However, at about $2,000 an ounce, platinum is more expensive than gold. The high cost of the raw material presents major challenges for the future wide scale use of platinum in fuel cells. Research at the U.S. Department of Energy (DOE)'s Lawrence Berkeley National Laboratory (Berkeley Lab) suggests that one possible way to meet these challenges is to think small – really small. A study led by Gabor Somorjai and Miquel Salmeron of Berkeley Lab's Materials Sciences Division showed that under high pressure, comparable to the pressures at which many industrial technologies operate, nanoparticle clusters of platinum potentially can out-perform the single crystals of platinum now used in fuel cells and catalytic converters. "We've discovered that the presence of carbon monoxide molecules can reversibly alter the catalytic surfaces of platinum single crystals, supposedly the most thermodynamically stable configuration for a platinum catalyst," said Somorjai, one of the world's foremost experts on surface chemistry and catalysis. "This indicates that under high-pressure conditions, single crystals of platinum are not as stable as nanoclusters, which actually become more stabilized as carbon monoxide molecules are co-adsorbed together with platinum atoms." "Our results also demonstrate that the limitations of traditional surface science techniques can be overcome with the use of techniques that operate under realistic conditions, says Salmeron, a leading authority on surface imaging and developer of the in situ imaging and spectroscopic techniques used in this study. He is also the director of Berkeley Lab's Materials Sciences Division. Gabor Somorjai (left), an authority on catalysis, and Miquel Salmeron, an authority on surface imaging, used a high-pressure Scanning Tunneling Microscope to observe the surface of a platinum catalyst under actual industrial reaction conditions. "Our observations of the large-scale surface restructuring of stepped platinum highlights the strong connection between coverage of reactant molecules and the atomic structure of the catalyst surface," says Somorjai. "The ability to observe catalytic surfaces at the atomic and molecular levels under actual reaction conditions is the only way such a phenomenon could be detected." "Such conditions will likely inhibit any surface restructuring process that requires the overcoming of even moderate activation barriers," Somorjai says. Says Salmeron, "The unanswered question today is what are the geometry and location of the catalyst atoms when the surfaces are covered with dense layers of molecules, as occurs during a chemical reaction." 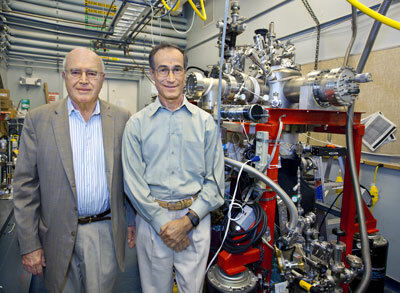 Somorjai and Salmeron have for many years been collaborating on the development of instrumentation and techniques that enable them to do catalysis studies under realistic conditions. They now have at their disposal unique high-pressure scanning tunneling microscopes (STM) and an ambient pressure x-ray photoelectron spectroscopy (AP-XPS) beamline operating at the Berkeley Lab's Advanced Light Source, a premier source of synchrotron radiation for scientific research. "With these two resources, we can image the atomic structure and identify the chemical state of catalyst atoms and adsorbed reactant molecules under industrial-type pressures and temperatures," Salmeron says. 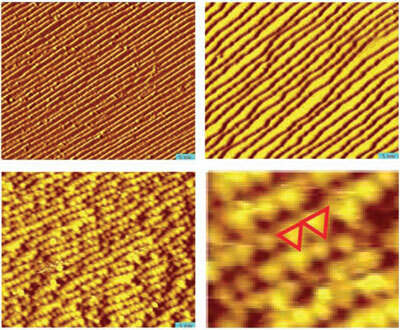 STM images revealed the formation of nanoclusters on the platinum crystal surfaces, and the AP-XPS spectra revealed a change in carbon monoxide electron binding energies. A subsequent collaboration with Lin-Wang Wang, a theorist in Berkeley Lab's Computational Sciences Division, explained the change in structure as the result of the relaxation of the strong repulsion between carbon monoxide molecules that arises from their very high density on the surface when in equilibrium with elevated pressures of the gas. "In the future, the use of these stable platinum nanoclusters as fuel cell catalysts may help to boost performance and reduce costs," Somorjai says.The next step for Somorjai and Salmeron and their research team will be to determine whether other adsorbed reactants, such as oxygen or hydrogen, also result in the creation of nanoclusters in platinum. They also want to know if nanoclusters can be induced in other metal catalysts as well, such as palladium, silver, copper, rhodium, iron and cobalt. "If this nanoclustering is a general phenomenon, it will have major consequences for the type of structures that catalysts must have under high-pressure, high-temperature catalytic reaction conditions," Somorjai says. A paper on this research appears in the journal Science, titled "Break-Up of Stepped Platinum Catalyst Surfaces by High CO Coverage." Co-authoring this paper with Somorjai and Salmeron were Feng Tao, Sefa Dag, Lin-Wang Wang, Zhi Liu, Derek Butcher and Hendrik Bluhm.